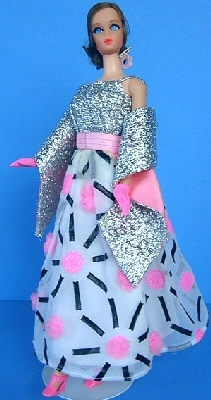 The dress has a silver lame bodice with silver spaghetti straps. The skirt is white organdy over white satin and is decorated with mod 3-D flowers. The flowers are composed of pink puffs with black rays surrounding each puff. The dress has a rose pink satin cummerbund style waist band & the sawl is lined in the same satin. The short hot pink gloves are very hard to find.